Royal babies have been on everyone’s mind lately, and we recently saw two babies born in the royal family within less than a month of each other. Not only have been people been doing web searches for Prince George and Maud Windsor, they’ve been searching for royal baby names in general, uncommon royal names, and royal names that nobody else is using. So here is a list of queens and princesses connected to English royal houses by either birth or marriage, whose names aren’t popular or common in Australia (although I can’t promise nobody else will use them). Adeliza of Louvain married Henry I, and became queen of England. She was considered pretty, but didn’t manage to produce any royal heirs. However, after Henry’s death she re-married, and had seven children; she is an ancestor of many of the noble English families. William the Conqueror had a daughter called Adeliza, named after his sister – the name wasn’t uncommon amongst Norman-French aristocracy. Adeliza is a medieval English form of Adelais, a short form of Adelheidis, the original old Germanic form of Adelaide. It’s pronounced ad-uh-LEE-za. Although it doesn’t have any connection to the name Elizabeth, it looks like a combination of Adele and Eliza, and might feel like a way to honour relatives who have variants of these names. It’s rare, but doesn’t seem unfamiliar. 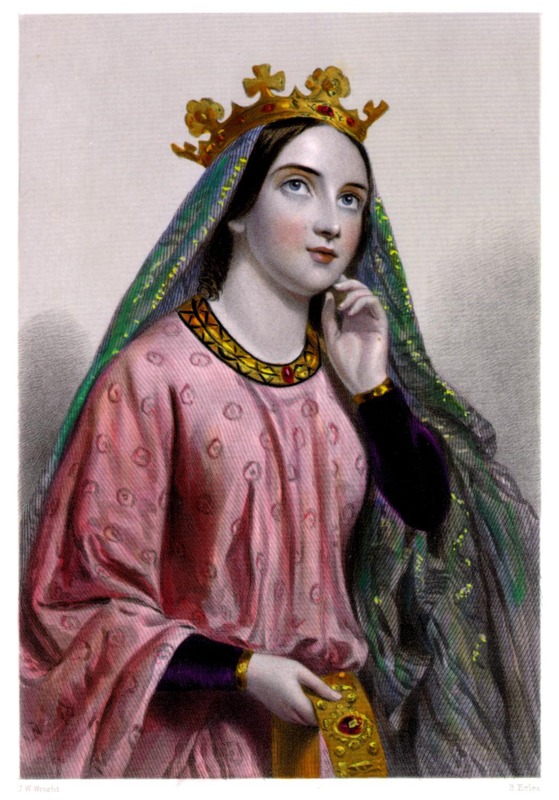 Berengaria of Navarre was Queen of England through her marriage to Richard I, “the Lionheart”. She is the only English queen never to set foot in the country, since she only visited England after her husband’s death, when she was no longer queen. Richard himself spent only a few months in England during his marriage, as he was busy Crusading. Richard and Berengaria never had any children, and it is not known if their marriage was ever consummated, as they spent so much time apart. Richard’s family seem to have liked her, and there are a few other royal English Berengarias, perhaps named after her. Berengaria was a traditional name amongst Spanish royalty, and is the feminine form of Berengar, an ancient Germanic name meaning “bear spear”. It is pronounced behr-en-GAR-ee-uh, and the name has been bestowed upon a planet in the Star Trek universe inhabited by dragon-like creatures. This doesn’t sound like any currently popular names, and the nickname Berry is appealing. Christabel was the middle name of Princess Alice, wife of Prince Henry, Duke of Gloucester, a son of George V. Princess Alice was born into the aristocracy on both sides of her family, and was a direct descendant of Charles II, through an illegitimate line. She is related to Sarah, Duchess of York, the wife of Alice’s great-nephew, Prince Andrew. Just after the Second World War, Prince Henry was appointed Governor-General of Australia, and he and Princess Alice lived in Canberra for two years. The name Christabel is a combination of Christina with a -bel suffix, but Princess Alice was given this name because was born on December 25, and the name suggests Christmas bells. Her niece Princess Alexandra was also born on Christmas Day, and shares the middle name Christabel. Apart from the Christmas connection, this pretty name might seem like a good way to honour a Christine and an Isobel (for example) simultaneously. Elfreda was one of the wives of Edgar I, and she was the first king’s wife to be crowned and anointed as Queen of England. Beautiful and powerful, she was unfortunately linked with the murder of her stepson Saint Edward the Martyr, and ever after appears in medieval history in the role of evil stepmother. Her own son, replacement to the martyred Edward, was Ethelred the Unready, only a child when he took the throne. Elfreda was a traditional name amongst Anglo-Saxon royalty, and Alfred the Great of Wessex had a daughter named Elfreda, an ancestor of Queen Matilda, the wife of William the Conqueror; through Matilda, the monarchs of England are descendants of the House of Wessex. There is a Saint Elfreda, an Anglo-Saxon princess. Elfreda is a modern spelling of the Anglo-Saxon name Ælfþryð, meaning “elf strength”. The name went out of use after the Norman Conquest, but was revived in the 19th century, although it never became popular. Freda would make a good nickname – unfortunately, sweet Elfie would probably be misheard as Alfie, leading to confusion. Eugenie was the second name of Victoria Eugenie, a grand-daughter of Queen Victoria who married Alfonso XIII and became Queen of Spain. Her grandson Juan Carlos I is the current king of Spain. Unfortunately, her marriage to Alfonso wasn’t particularly happy, and she didn’t enjoy great popularity with the Spanish people – she was greeted with an assassination attempt on her wedding day. After the Republicans gained power, Victoria Eugenie went into exile with the rest of the Spanish royal family. Queen Victoria Eugenie’s middle name was in honour of her godmother, Maria Eugenia “Eugénie” de Montijo, empress consort to Napoleon III. Eugénie was a member of the Spanish nobility, and after the defeat of the Second French Empire, she lived in England, where she became friendly with the British royal family. The name remains well-known because of Princess Eugenie of York, daughter of Prince Andrew, who was named after Victoria Eugenie. Eugenie is the Anglicisation of Eugénie, the French form of Eugenia, which is the feminine form of Greek Eugenius, meaning “well born, of noble birth”. This elegant name is said yoo-JEE-nee, and Gina or Genie could be used as nicknames. Princess Marina of Greece and Denmark was a cousin of Prince Philip. Like her cousin, she married into the British royal family when she wed Prince George, the Duke of Kent, an uncle of Queen Elizabeth II; she was the last foreign-born princess to marry into the British royal family. Princess Marina was attractive and stylish, earning her a place in the International Best Dressed List Hall of Fame, and her favourite shade of blue-green became known as “Marina blue”. Princess Marina’s mother was the grand-daughter of Tsar Alexander II of Russia, and Marina may have been named after Princess Marina of Russia. Princess Marina and the Duke of Kent were married in 1934, and a year later, Swiss water-ski champ Marina Doria was born, which looks more than coincidental. Oddly enough, Marina Doria also became Princess Marina, when she married a prince of Naples. Marina’s name has been passed down to her grand-daughter, Maud Elizabeth Daphne Marina Windsor, and I have seen a birth announcement for a Scarlett Marina this week. Marina is the feminine form of the Roman name Marinus, which may be from the Latin for “of the sea”. There are two saints named Marina, and it’s also the name Saint Margaret is known by in the Orthodox church. Marina is a very beautiful name, and familiar in Australia due to entertainer Marina Prior. Princess Victoria Melita was a grand-daughter of both Queen Victoria and Tsar Alexander II, making her Princess Marina’s great-aunt. Her love life was one of great turmoil, because she fell in love with her cousin Kirill, Grand Duke of Russia, but was forced to marry her cousin Ernest, Grand Duke of Hesse instead. The marriage wasn’t a success, as Victoria Melita preferred Kirill, and Ernest preferred young boys. Soon after Victoria and Ernest ‘s divorce, Kirill was almost killed during the Russo-Japanese War, and this brush with death made him realise that nothing was more important than being with his true love. He defied his family, and married Victoria Melita, much to his parents’ rage and disgust. Although their marriage and family life was happy, the Russian Revolution and subsequent exile was a setback, and the couple rather naively supported the Nazi Party. More emotional pain followed for Victoria when Kirill was unfaithful to her, which she never got over. Her life contained some bitterness, but Victoria Melita’s middle name has a sweet meaning. Melita is the Latin name for the island of Malta, thought to come from its Greek name, Melite, meaning “sweet as honey”; Malta was famous for its honey production. This doesn’t sound out of place next to popular names like Mila and Layla, and would be a great way to honour Maltese ancestry; you could use Millie or Lita as nicknames. Princess Sibylla (born Sibylle) was a great-granddaughter of Queen Victoria who married her second-cousin Prince Gustaf Adolf (known as “Edmund”) of Sweden; her son Carl XVI Gustaf is the current king of Sweden. The couple don’t seem to have been very popular in Sweden, being plagued by rumours of Nazi sympathising, of which there is no proof. Unfortunately, Sibylla did have quite a few relatives in the Nazi Party in Germany, who threw her a big fat Nazi wedding, and this can’t have been a help at soothing suspicions. The name Sibylla (or Sybilla) has been used amongst European royalty and nobility since the Middle Ages, and has been connected with the British royal family from early on. William the Conqueror’s son Robert was married to a Sybilla, and Henry I had an illegitimate daughter named Sybilla, who married Alexander I of Scotland. Sibylla is from the Greek word for a female prophet of the ancient world who uttered divine revelations in a state of frenzy; the word became sibyl in English. During the Middle Ages, it was thought that the Greek and Romans sybils had been precursors to Christian prophecy, and therefore gained respectability as a Christian concept and name. This name (and its variants), though uncommon, is quite trendy in Australia, being known from actress Sibylla Budd, and the heroine of My Brilliant Career, Sybylla Melvyn, whose name inspired feminist publishing house, Sybylla Press. The splendidly-named Sigrid the Haughty was supposedly the wife of Sweyn Forkbeard, who ruled England before the Conquest, in the days when the Danish royal house held the throne. It’s not clear if Sigrid was her real name, because it seems that Sweyn’s wife was actually Polish rather than Scandinavian, and in fact we can’t be sure if “Sigrid the Haughty” even existed. She may well be a fictional character, but her story is compelling. Beautiful and proud, Sigrid was a woman of great political power, who tended to wreak terrible revenge on those who annoyed her, and is supposed to have burned two of her suitors to death to discourage others. It could be that this fascinating lady of legend was tacked on to a real Polish woman who married Sweyn, and became the mother of King Canute the Great. Sigrid is from the Old Norse name Sigríðr, meaning “beautiful victory”. This is another name familiar in Australia because of an actress – the very famous Sigrid Thornton. The usual nicknames are Siri and Sigi. Thyra was the daughter of Sigrid and Sweyn Forkbeard, the sister of Canute the Great. She was married to Godwin, the first Earl of Essex, the father of King Harold who fell at the Battle of Hastings. She didn’t live very long, and she and Godwin didn’t have any children together, so she’s rather a footnote in the history books. She may have been named after Thyra, the wife of King Gorm the Old of Denmark; they were the parents of Harald Bluetooth, the father of Sweyn Forkbeard. According to at least one source, Queen Thyra was English, the daughter of King Ethelred of Wessex. She was said to be a smart and sensible woman who led an army against the Germans, and was described as the “pride of Denmark”. According to legend, one of Thyra’s daughters was captured by trolls and carried off to their kingdom in the far north. Thyra is from the Old Norse name Þýri, derived from the name of the god Thor, and possibly meaning “Thor’s war”. The name is pronounced TEE-rah, and I think it’s attractive and contemporary-sounding, although pronunciation may be an issue, with people trying to say it THY-rah. POLL RESULT: People’s favourite names were Marina, Adeliza, and Christabel, and their least favourite were Elfreda, Thyra, and Berengaria. I love the history of the English monarchy, especially the medieval stuff! Some great names in there as well. I’m liking Adeliza, Berengaria, Sigrid and Sybilla. Sigrid the Haughty’s real name may have been Swietoslawa…but it’s very hard to know anything with certainty. Yes it’s far too long ago … I suspect they called her Sigrid because her Slavic name was too hard for them to say, and then it got confused somehow with the legendary Sigrid the Haughty. It’s all a bit of a muddle. Just wanted to say that I really enjoy your blog, especially the birth announcements from the papers. I sometimes recognise the ones from the Advertiser. Love the name Sybilla from the list. Thank you so much! Doing the birth announcements is one of my favourite things for the blog. Sybilla seems to be a real Australian favourite. Forgot to mention a family I know who has four beautifully named daughters… Sybilla, Leila, Eva and Mietta “Mim”. I’d actually never heard Sybilla before that, only Sybella. Gorgeous girly sibset … I think Sybella started as a trend so people could get Bella as the nickname. Sybilla is a gorgeous name. I love Sigrid and Eugenie. I know a little girl called Sigrid Mary who goes by Ziggy which I think is super cute.